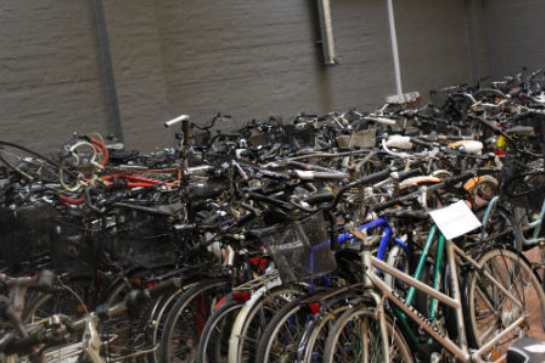 The assessment is made on 8000 second-hand bikes, which is the average annual amount of lost property bikes that are sent to scrap from the Copenhagen area. A little more than 1/4 of the lost property bikes are in so bad condition that they cannot be re-used, so the 8000 lost property bikes correspond to a recycled amount of 5800 bicycles. This functional unit thus captures the final function delivered, including the location, the durability of the bikes and the annual size of the expected operation. Photo: Lost bikes collected on Funen, Denmark. Photocredits Fyns Politi. Information on the amount of lost property bicycles were from Baisikeli ApS (pers. comm.) and Baisikeli annual accounts 2012.